As I pedaled onto the broad cement path and looked across the water, a ray of spring sunshine glinted off the steel guardrail, and I smiled in delight at the new trail. Cycling up to meet friends for a loop around Lake Washington’s north end, I took a quick detour onto the buzzing, floating SR 520 Trail, part of the State Route 520 Bridge, because I just couldn’t wait. This would be the end of our day’s ride. There are many access points to start a loop ride and explore the “top of the lake,” but I chose Rainier Vista, the grand lawn on the University of Washington’s southeast corner, made even grander by the recent renovations around Husky Stadium. From a trail spur looking west, Drumheller Fountain spouts high above the grassy hillside. East across the light-rail station, Mount Rainier hovers among the clouds. We pedaled northeast onto the Burke-Gilman Trail, widened and smoothed through this part of campus. I charted a route that connects to city streets in Juanita and Kirkland before hitting the 520 Trail. At 26 miles, two-thirds of it is on paved trails. Popular starting points: Seattle’s Husky Stadium or Magnuson Park; Kenmore’s Log Boom Park; Bothell’s Wayne Golf Course Park or Juanita Bay Park. 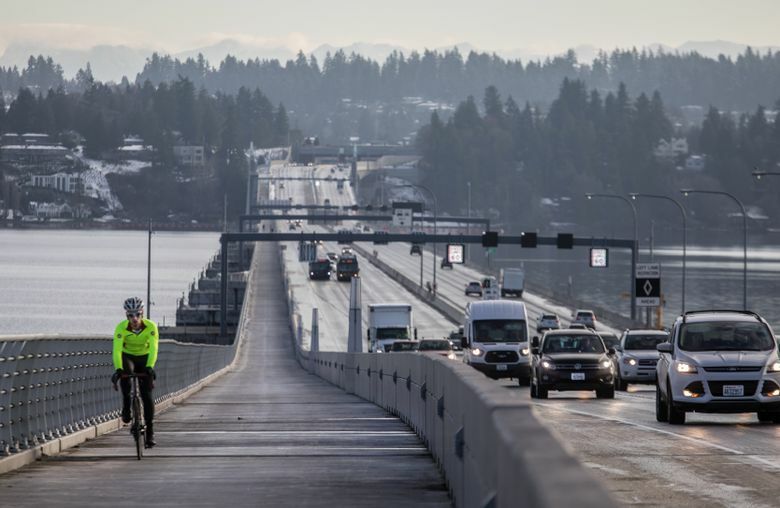 If we wanted more miles and less road, we could stay on the Burke until it connects with the Sammamish River Trail and go all the way to Redmond’s Marymoor Park and then the 520 — a 34-mile loop that’s entirely off-street. For most local cyclists, the Burke-Gilman is a familiar wooded trail. Some wryly say they know every bump of its old, root-heaved asphalt surface. Well, ride it again, because a winter 2017 renovation on 13 trail sections smoothed it considerably. Kenmore’s Log Boom Park is a restroom stop for trail users at the top of the lake. Soon after, you enter Bothell, where we exited the trail at the new Wayne Golf Course Park (no longer for golfing), turned right out of the gravel parking lot onto 96th Avenue Northeast, which becomes Waynita Way Northeast and then 100th Avenue Northeast as you enter Juanita. Cycle past shopping areas and be prepared for a two-mile stretch with no bike lane. South of the intersection with Juanita Drive, the road curves uphill but I lead my friends onto a broad, path that extends over the lake at Juanita Bay Park. This is prime birding on the Old Market Street Trail, traveling over wetlands and marshes boasting more than 100 species. Exit the trail onto Market Street, the route’s biggest climb, then coast into downtown Kirkland, where plentiful cafes and dueling coffee shops make for a perfect midride break. 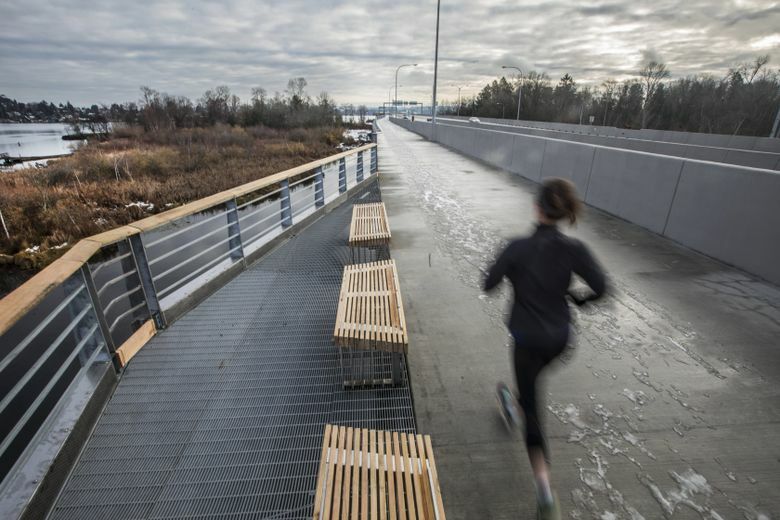 We pedaled slowly through shopping traffic, then past a string of parks and waterfront condo developments to the new jewel of this ride: the 520 Trail. The 5-mile bridge trail, accessed at the intersection with Northup Way, is invitingly wide and offers interpretive signage and wayside rest spots. On your way to the bridge, bike by small parks on the edges of the “three points” neighborhoods of Evergreen Point, Hunts Point and Yarrow Point. • Right onto 112th Avenue sends you parallel to Interstate 405 to downtown Bellevue, south of which the I-90 Trail leads back to Seattle. • Straight on Northup to Northeast 24th Street to continue on the 520 Trail’s older section. It parallels the highway past Microsoft headquarters and to the edge of Redmond’s Marymoor Park. After a block on Leary Way, connect to the Sammamish River Trail, which feeds into the park and snakes north along the river to Woodinville and back to the Burke-Gilman. As with many bike outings, such detours are enticing, and the new bridge trail makes them much easier. Visit Bellevue’s art museum, check out the Velodrome races at Marymoor, or pedal to the wine-tasting warehouses of Woodinville. For Eastsiders, a jaunt to the UW for Husky sporting events is now easy-peasy. Pedaling onto the wide bike and pedestrian lane on the bridge, new angles on the city come into view. Climb the 70-foot boat passage on the Bellevue side and see the wooded hump of Capitol Hill across the water. The geometry of Husky Stadium’s spectator stands cuts the skyline north of the bridge. Along the flat center section of the bridge, a series of five interpretive stops educates you about points of interest, ecology, bridge construction and history. More wide spots with benches allow for lingering while not impeding cycling and walking traffic. Traffic whizzes by, car tires causing the bridge expansion joints to buzz rhythmically like circling bees. Nearing Seattle, a 40-foot climb provides another boat passage beneath, and for cyclists, a unique new view into another verdant habitat, that of Foster Island and Marsh Island. A pedestrian trail joined by tinker-toy bridges links these islands with East Montlake Park on the north side and Washington Park Arboretum south of the bridge. At our last overlook, we resolved to come back for a hike. We exited the 520 Trail and pedaled north along a quiet neighborhood street, then crossed the Montlake Bridge to return to the UW campus and end the tour. The “Lake Washington Loop” has long been a 50-mile challenge ride for cyclists, bisected by the I-90 Trail. The SR 520 Trail adds a welcome dimension to split that ride more ways, as well as a modest-length outing with desirable destinations. Bill Thorness is the author of “Biking Puget Sound” and “Cycling the Pacific Coast” (Mountaineers Books). Contact him at bill@thorness.com.